We used to visit Kerala once a year during our summer vacations when we were in North India. Our stay will be with the grandparents and we get to see our cousins from Bombay. It will be a fun filled vacation. Our grandparent’s house was surrounded by fruit trees like Mango, Guava, Jack fruit etc. There was a Citrus tree in the corner of the front yard, which my grandma watered and raised from an orange seedling which survived a long time without bearing any fruit. There was a humongous sweet mango tree right in the front yard which was there from my grandpa's childhood. There were 2 swings setup for the kids to play, one on the mango tree and the other on the guava tree, but everyone preferred to play on the swing tied to mango tree because it was strong and steady and will help you to swing high. Being scared of heights, I always liked to hang around the guava tree swing. Another personnel reason for me was that the mango tree bears tons of sweet mangos and when you start swinging hard, you might get knocked out by the falling mango :). But nothing seemed to bother anyone. Everyone waits patiently for their turns and occasionally parents had to separate the fighting ones from the scene.. lol. When it rains in the monsoon, the mangoes will be at their peak season and you can literally see a mango rain from this tree which generously drops the ripe mangoes into the river pebble filled front yard. After the rain subsides, the mangoes will be filled in baskets with burlap lining to remove moisture and the ripest ones will be handpicked by the adults to serve immediately. The rest will be placed in the storage to ripe. I don't remember us cutting any mangoes as they were in abundance and we used to bite into each and gobble some and threw the rest. Those were some good old memories. I regret now for the amount of the honey sweet mangoes I had wasted then. Now it hard to find that kind of sweet mangoes here. Few years ago when we visited our grandparent's house, now owned by my younger uncle, I saw the same tree standing there without much branches and it barely bears any fruits now. It still brings the warm nostalgia to all those who grew up in that house. The old mango tree is still in the front yard with lots of wild Vanda orchid growing as a parasite on them. It’s not just an old mango tree, but by standing firm it reveals the lesson of good work and hard labor of our great grandparents who planted it and passed on the fruit of labor to be enjoyed by generation after another. During one of our summer vacations we were introduced to the mango roll ups/leather that my grandma made. The mango leather was made in bulk by sun drying the mango pulp. The scorching sun and the availability of the honey sweet fruit were the best circumstances to create the delicious mango leather. My grandma used to make this for her kids when they were young and she continued to make it for us too. We were fortunate enough to enjoy the delicious treats she used to make for us during our visits. 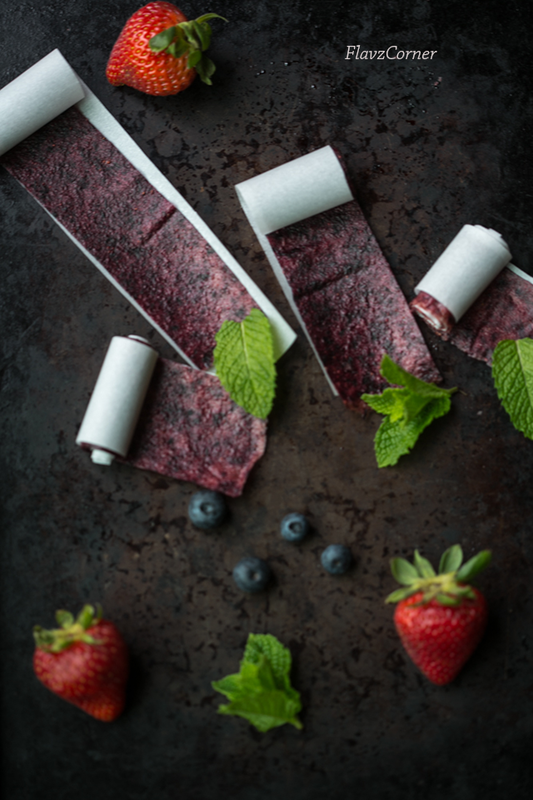 And those irresistible tastes took me down the memory lane and made me try my hands on these berry roll ups. Puree the berry mix with sugar in a blender. Line a baking sheet with parchment paper. 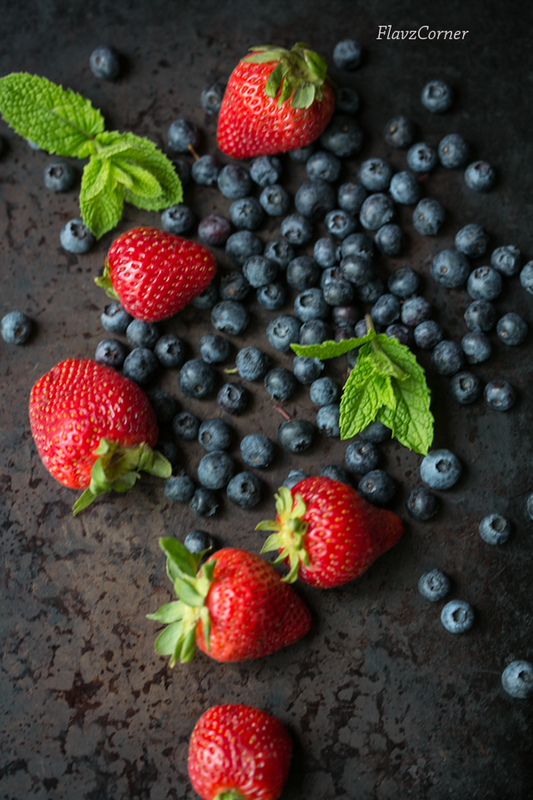 Pour the berry puree on the baking sheet and spread it evenly using an offset spatula by leaving some space on the sides. Place the baking sheet in the oven in the middle rack and let the puree dehydrate for 30 minutes. Lower the oven temperature to 170°F and set the timer for 3 hrs. After 3 hrs, take the baking sheet out of the oven. The center of the fruit roll up will be still smooth. Let the roll up cool for another hour. You can peel off the fruit sheet from the parchment paper once it is cooled down. Place the fruit sheet on a wax paper/parchment paper. 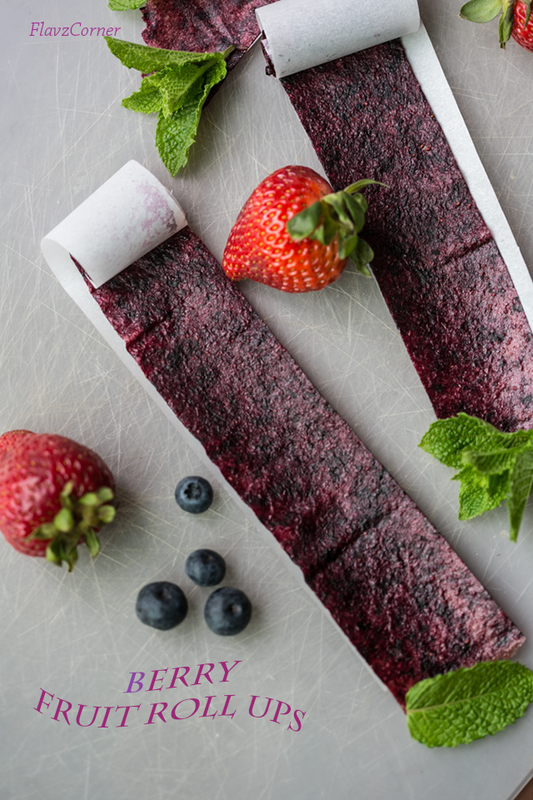 Cut them into long strips along with the parchment paper and roll them into fruit roll ups. Secure them with a string and store them in air tight containers. Never attempted fruit roll ups! Should give a try. Thanks for sharing. I have had mango roll ups but this is unique and beautiful..bookmarked to try,yummy !! Your fruit rollup turned out so good. I love the gorgeous blue. Hello Shibi. Your grandparents house seems to be a paradise, love all these fruit trees, it's a bless to have a house surrounded by them. I've had roll ups before, but never made them. I really should, and use your recipe -- it looks terrific. Fun stuff -- thanks.